In the cleanup following the 1989 Exxon Valdez oil spill, workers rescued hundreds of wild birds from the shores of Prince William Sound. One bald eagle, poisoned by oily prey, came to the rescue center with a wing so mangled it had to be amputated. No one expected the bird to survive. But even after vets repeatedly took the eagle's blood for transfusions to other eagles, "One Wing" clung to life, an unexpected survivor. ONE WING'S GIFT tells the heartwarming stories of this special bird and a dozen others rescued by the Bird Treatment and Learning Center in Anchorage, Alaska. From the majestic bald eagle to the common raven, from the great horned owl to the tiny black-capped chickadee, Bird TLC has been rescuing and rehabilitating Alaska's diseased and injured wild birds since 1988. Joan Harris's exquisitely detailed graphite portraits of each bird complement her touching tales. Harris spent more than four years working on the intricate illustrations, delicately hand-coloring these pencil drawings of some of the most inspiring birds from the rescue center. This uplifting book will appeal to bird lovers of all ages. 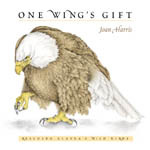 Harris will donate a portion of her royalties to Bird TLC. If you would like a copy, contact Dan @ 1-907-562-4852 or office@birdtlc.net . The price is $17.95 & $5.00 shipping & handling.